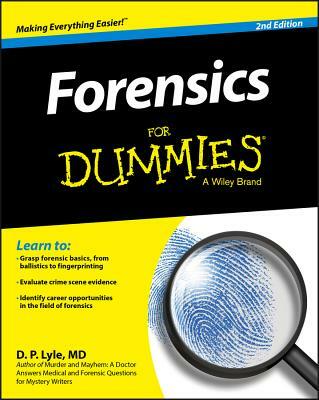 Forensics For Dummies takes you inside the world of crime scene investigation to give you the low down on this exciting field. Written by a doctor and former Law & Order consultant, this guide will have you solving crimes along with your favorite TV shows in no time. From fingerprints and fibers to blood and ballistics, you'll walk through the processes that yield significant information from the smallest clues. You'll learn how Hollywood gets it wrong, and how real-world forensics experts work every day in fields as diverse as biology, psychology, anthropology, medicine, information technology, and more. If you're interested in a forensics career, you'll find out how to break in--and the education you'll need to do the type of forensics work that interests you the most. Written for the true forensics fan, this book doesn't shy away from the details; you'll learn what goes on at the morgue as you determine cause of death, and you'll climb into the mind of a killer as you learn how forensic psychologists narrow down the suspect list. Crime shows are entertaining, but the reality is that most forensics cases aren't wrapped up in an hour. This book shows you how it's really done, and the amazing technology and brilliant people that do it every day. Forensic scientists work in a variety of environments and in many different capacities. If you think television makes it look interesting, just wait until you learn what it's really like Forensics For Dummies takes you on a tour of the real-world science behind solving the case. D. P. Lyle, MD, is the award-winning author of many nonfiction books and works of fiction. He is the co-host of Crime and Science Radio, and has worked with the writers of popular television shows such as Law & Order, CSI: Miami, Monk, Judging Amy, House, and Pretty Little Liars.